Wet-on-wet watercolor painting is an introduction to the beautiful world of color for the young child. There are many ways to paint, but wet-on-wet watercolor is a dreamy, fluid, mostly formless painting method that allows the painter to fully experience colors. It's perfect for the process-oriented kindergarten age child, and great for bringing mama into a slower, more meditative (less product-oriented) space as well! 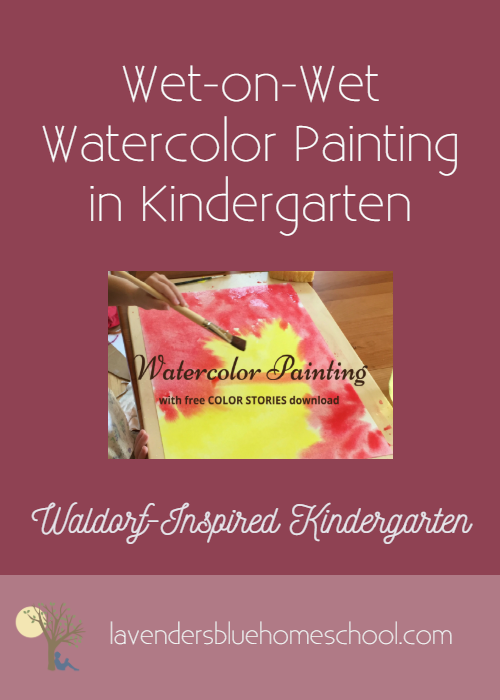 In this post I'll walk you through how to do wet-on-wet watercolor painting with your kindergarten child, including step-by-step instructions and a supplies guide. I also have a bonus guide to color stories for you, with a color story for each season! Scroll down to the bottom of the page to sign up to receive your free copy! Before you start painting with your child, take time to delight in the colors around you. As you go about your days you'll experience thousands of colors. Can you notice them more? Be amazed by their amazing variety, the extraordinary number of shades and tones in your visual path. Feel some awe at the idea that they can be reduced to just seven pure colors of the rainbow. Notice the effects that different colors have on you. Open up your awareness of color as part of your life. Color theory is typically taught to preschoolers in this fashion: Here's some blue and here's some yellow; let's mix them together and get green! Fun, yes. Useful information, yes. A bit shallow? Perhaps. Wet-on-wet watercolor takes a different approach, a much slower experiential involvement in color. If you follow the Lavender's Blue Kindergarten Curriculum (or any Waldorf-inspired approach) you will have time to explore the primary colors and allow the secondary colors to arise in one painting session a week over the course of the year. This is a meditative and therapeutic painting technique, rich for your child, calming for you. Start by painting with only one or two colors at a time. This gives your child time to explore the world of color and also lowers frustration because the colors will always mix beautifully on the page! Plan to paint alongside your child. In kindy the focus is on imitation, imagination, and sensory experience, rather than technique or instruction. I do recommend showing your child how to treat the materials with respect. It's also helpful to have a rhythm around your wet-on-wet watercolor painting times (including set-up and clean-up), but allow her to paint however she wants within that structure. Remember you're painting colors, not forms, and there's no goal for the end result in kindergarten. Show your child how to set up the paper on the board, dip the brush in the paint, and wipe excess paint back into the paint jar. Show him how to rinse his brush in between colors and then pat the brush dry on the sponge. These steps will help keep the paintings from turning into swamps, and over time your child will gain better control over the amount of paint on the page. Play with brush strokes, shapes, and amounts of paint. Allow forms to evolve and be painted over, and end with a page filled with color. Relax and enjoy the process of painting and playing with color! Your child will imitate you and also explore in her own way. Leave your paintings to dry flat on the boards (take care not to tip them or the paint will run off). It will take awhile...we used to spread a blanket on the living room rug and have a lunch "picnic" on painting days because the table was full. Your dry paintings will be lovely to display or re-use as cards, nature table backgrounds, journal covers, and so on. You might also have some not-lovely paintings, and that's fine too! One of my daughters went through a phase when she was tiny where she would paint, then clean off her painting with the sponge, paint again, sponge again, and so on. The end result was atrocious - but she was developmentally right where she needed to be, engaging in the sensory experience, and focused on the process not the product. Read on for more details on supplies and step-by-step instructions on how to set up for painting! To get started, you will need some painting supplies. But don't get too hung up on this! When we first started, we had cheap brushes, cheap paints, and regular paper. Over time I invested in high-quality art supplies. And yes, they do make a big difference - but just start where you can. Some of your supplies (brushes and painting boards) will last for years and others (paints and paper) will need replenishing. When we first switched to good watercolor paper, I was cutting the sheets in half to make them last longer. I bought one nice brush to start and we took turns. So do what you can with your budget! When you're ready to invest in painting supplies, I recommend 1-inch flat watercolor brushes and good thick watercolor painting paper - it needs to withstand a lot of wetness. You only need the three primary colors in kindergarten. The Stockmar circle color paints are a popular option that mix well together. The paints are highly concentrated, so you'll be adding water to achieve your desired color intensity, and they'll last longer than you think. Be sure to keep mixed paint in the fridge. Painting boards are also recommended (you can purchase these or make your own). The painting board protects your table, provides a smooth surface for painting, and a spot for your paintings to dry. If you have a large group or you're doing multiple paintings, you can (very carefully) stack painting boards for drying using small blocks at the corners. We use our painting boards all the time all around the house, to protect the table or floor for coloring, main lesson bookwork, or other projects. You'll need a bunch of jars for painting, and you can purchase these or re-use mason jars, jam jars, baby food jars, etc. 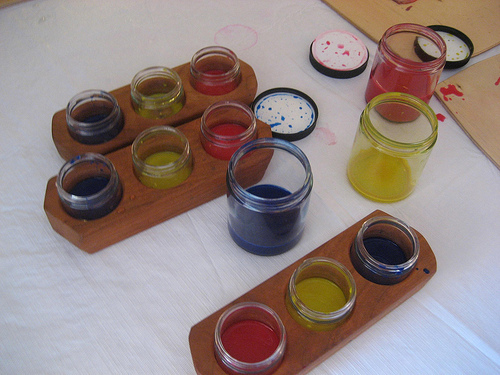 Each paint color needs a mixing jar (which will be lidded and stored in the fridge). Then each person painting needs a small jar for each color and a large jar of clean water for rinsing their brush. This practice of giving each person a small amount of paint minimizes problems with color mixing or spilling. The goal is to blend colors together on the page (not in the jar), but of course this takes practice! I like to have lids for my small jars as well, and if a blue starts to look more like purple, I don't worry about it - just pop it in the fridge to paint with another time. For wet-on-wet watercolor, the paper also needs to be soaked or saturated with water before you begin. We'll go over the most common method below. You'll need a basin that is large enough to soak your paper. I use a large under-the-bed-type tupperware for this, and it doubles as a storage container for all our painting supplies. Aprons, wet rags for cleanup, oil cloth for table, etc. Use a large jar to mix a small amount of paint with a large amount of water. Use a popsicle stick to mix it up. You can test the color on scrap paper and experiment to get the proportions right. Store mixed paint in a lidded glass jar in the fridge. Fill a large basin with just a couple inches of water. Take one piece of paper for each person, dip it into the water, flip and let soak. Dip and flip the papers one at a time so they don't stick together. Set up your table with a painting board, brush, damp sponge, large jar of rinse water, and small empty paint jar (per color) for each person. You may wish to have aprons and wet rags ready also. Pour a very small amount (like a half an inch) of the mixed paint into each paint jar. This way, if the colors get mixed, it's only a small amount of paint (which can also be re-used later - just put on a lid and stick it in the fridge). Each person can bring his board and sponge over to the water basin. Take a piece of paper and lay it nice and flat on the board then use the sponge to smooth out any bubbles and wipe off extra water. Use a light touch; don't scrub the paper. Notice the paper has a rougher texture on one side - that's the side you want facing up for painting. Let everyone come back to the table and get good and settled in before you proceed. A special song or fingerplay for painting day is helpful for this. Take up your brush and begin painting. Tell your color story, paint slowly, and fill up the whole page with color. When you're finished painting, leave the papers to dry flat on the painting boards and clean everything else up. Hint: Washing out all the jars and sponges in the big soaking basin might be the most fun part for a preschool-aged child! Sign up below to receive your copy of the quick-start guide to color stories. I hope you enjoy it! Sign up Here for the COLOR STORIES Bonus!